Spacious, cosy, quiet and well equipped house with yaquzzi and pool. Owner very helpful. Love it all. We wish we could have stayed longer and would happily stay again when we visit Cairns. It is a relaxing place to be, very close to Crystal Cascades. We enjoy the party light jacuzzi, and the kitchen is well equipped. The accommodation was priceless situated in the rainforest with everything that you would need available !!! The host is the most warm and loving man who helped us with any of our needs !! I give this property 10/10 !! Loved every second of my stay. Location-amazing, host-amazing, experience-the best! Couldn’t fault a single thing! Will be back! Perfect hosts and amazing property! Loved our stay and the hot tub is a massive bonus. Perfect way to unwind after exploring the surrounding area. Would recommend to friends and family. The location was fantastic. It was a very relaxing place to be. The spa was brilliant looking up through the canopy to the sky. Couldn't fault the house. The teenagers thought it was fantastic they were especially happy with the large day bed and hammock on the balcony. Family friendly. Ambient atmosphere. Right amount of space to ensure the family is not encroaching each others personal space. Friendly and hospitable host who is available if/when necessary to assist with stay enquiries. Brochure stand - great touch. It has a wide variety of travel/tour info/maps. Small shopping centre not too far away for stocking up on personal/grocery supplies. This house was one of the best places I have stayed at in my life. The house was spotless and provided an amazing range of activities of things to do. Laurie was very welcoming and offered a huge range of facilities during the stay. I highly recommend staying here for more than one day. 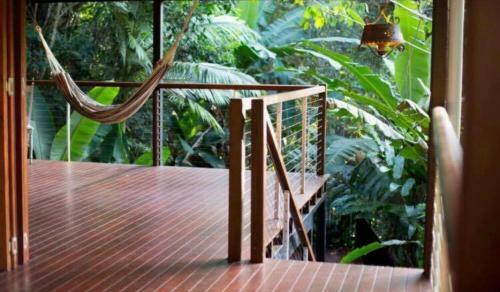 This is an amazing property set in the rainforest with a Beautiful pool and spa. The owner was so helpful. My family loved the space. We will be back next time to stay two weeks. It was so cool to head out to the Great Barrier Reef for the day and come home to sit on the massive timber verandah with a glass of chilled wine in serenity and peace of not being in the city of high rise apartments. The owner told us of a great family pub for a meal which was 10/10 and only about 5 minutes in the car from the property. Loved it all. An amazing place to stay. Wish could have stayed longer. Thanks again Laurie for everything including the transfer of our luggage to the airport. 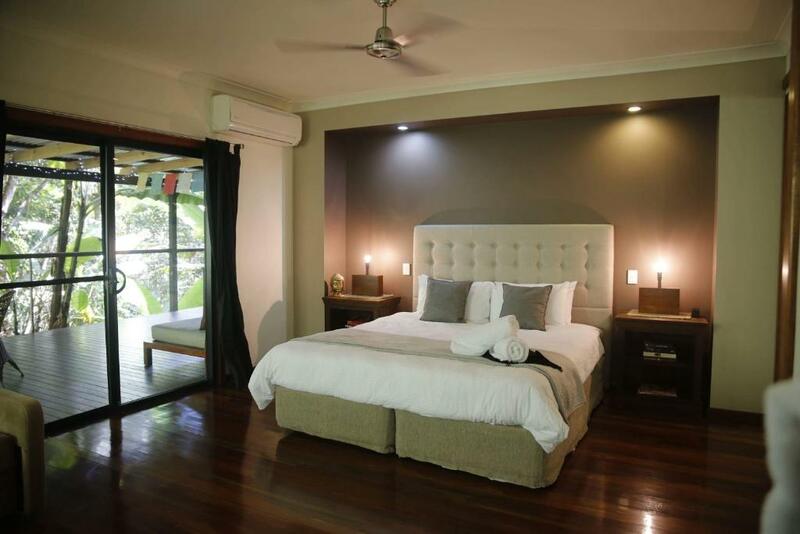 Lock in a great price for Treetops Retreat Cairns - rated 9.7 by recent guests. 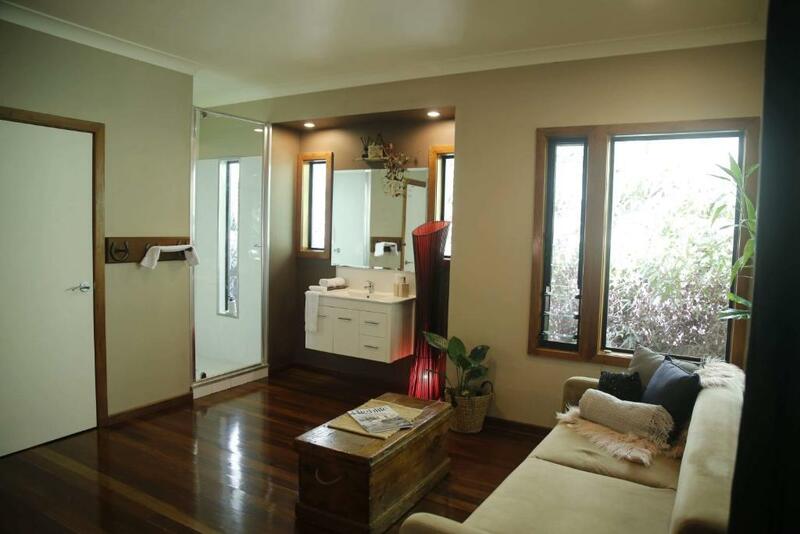 The property is a short drive to Cape Tribulation / Daintree Rainforest, Port Douglas, Palm Cove, the islands, Kuranda Village and central Cairns. The Cairns Civic Theater is 5.6 miles from the holiday home, while Cairns Base Hospital is 6.2 miles away. 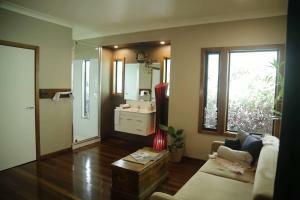 The nearest airport is Cairns Airport, 6.8 miles from the property. 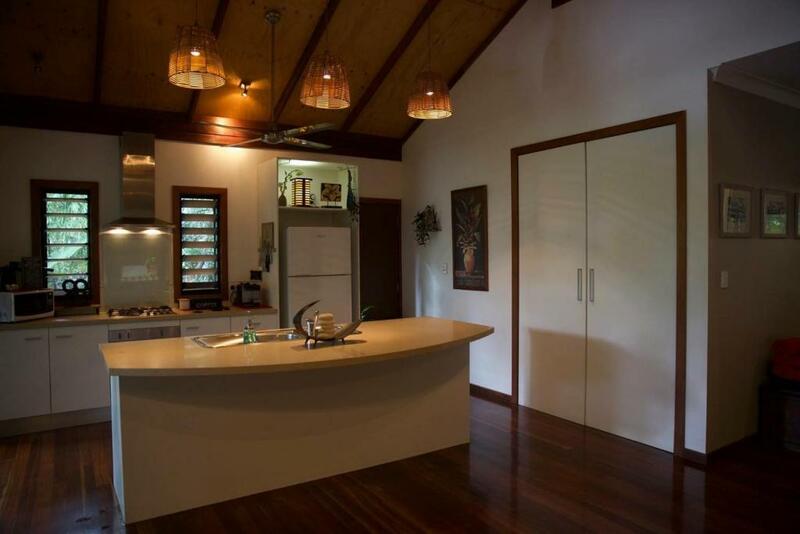 Treetops Retreat Cairns has been welcoming Booking.com guests since 27 Dec 2017. When would you like to stay at Treetops Retreat Cairns? This holiday home has a balcony, tea/coffee maker and satellite TV. Alternative bedding arrangement: Outdoor daybed (large Balinese). Stay in the treetops in the world heritage listed rainforest, walking distance to waterfalls, swimming holes & rainforest bushwalking tracks. Treetops is a short drive to most tourist hotspots including (Cape Tribulation / Daintree Rainforest, Port Douglas, Palm Cove, the islands, Kuranda Village, Cairns, Great Barrier Reef) amongst others. No change for extra guests, one set fee for the treehouse as a whole. Treat yourself, relax and unwind, reserve your booking at Treetops Retreat. I have called Cairns home for 15 years, I moved to Cairns from Brisbane with my job and so I could complete law school. Crystal Cascades was the first place I ever visited when I moved to Cairns, I fell in love. I can offer you first hand information on popular sights to see, Waterholes for swimming, Great Barrier Reef, Atherton Tablelands and where to eat. Treetops is so much better than a hotel room and more cost effective than for a large family on holiday. I know you will love Treetops as much as I do. I am told by all guests upon arrival that the photos do not do treetops any justice and it is far more beautiful in person and secondly it's be best air Bnb experience they have ever had. All guests upon arrival to treetops are greeted and a quick handover is conducted. The grounds, pool and spa are maintained for guests daily so it is perfect for rainforest swimming and can we can assist with tourist bookings. Treetops is located in Crystal Cascades, Redlynch - Queensland, Australia. Crystal Cascades is a beautiful neighbourhood nestled amongst the rainforest yet only a 20minute drive to the Cairns Centre and the Esplanade. There are beautiful walking tracks, walking distance from the house and fresh water creeks, swimming holes and waterfalls to explore.Treetops Retreat is the matriarch of the rainforest at the stunning Crystal Cascades Rainforest – relaxation, entertaining and privacy are her key points of focus.This beautiful tree house is on an acre of stunning rainforest. Stay in the treetops in the world heritage listed rainforest, walking distance to waterfalls, swimming holes & rainforest bushwalking tracks.Treetops is a short drive to most tourist hotspots including (Cape Tribulation / Daintree Rainforest, Port Douglas, Palm Cove, the islands, Kuranda Village, Cairns, Great Barrier Reef) amongst others. 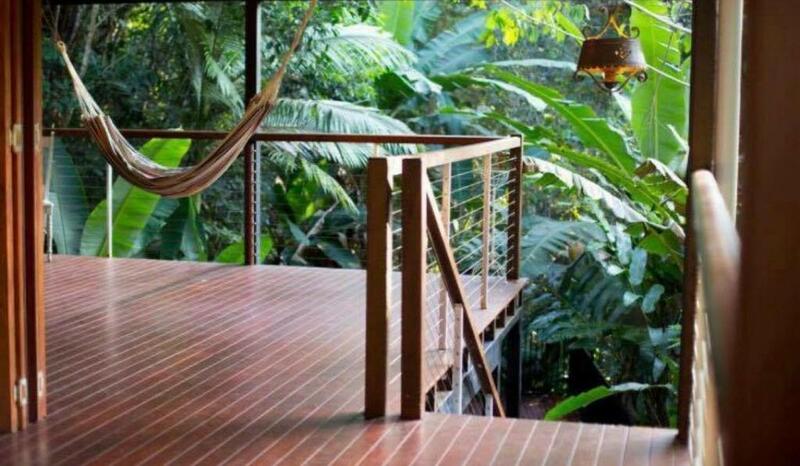 A pure heaven in the treetops, Chill out and relax on one of her spacious decks high in treetop canopy – perfect for entertaining, swim in the refreshing rainforest swimming pool, relax in the private heated rainforest spa deck at night looking at the stars. 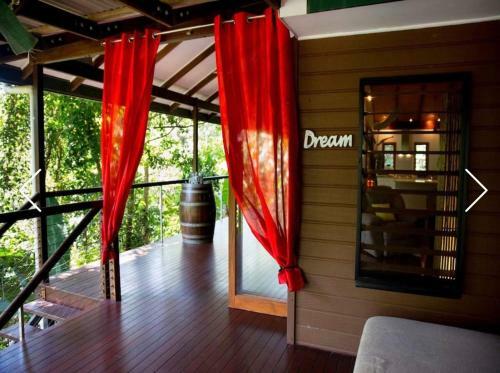 House rules Treetops Retreat Cairns takes special requests - add in the next step! 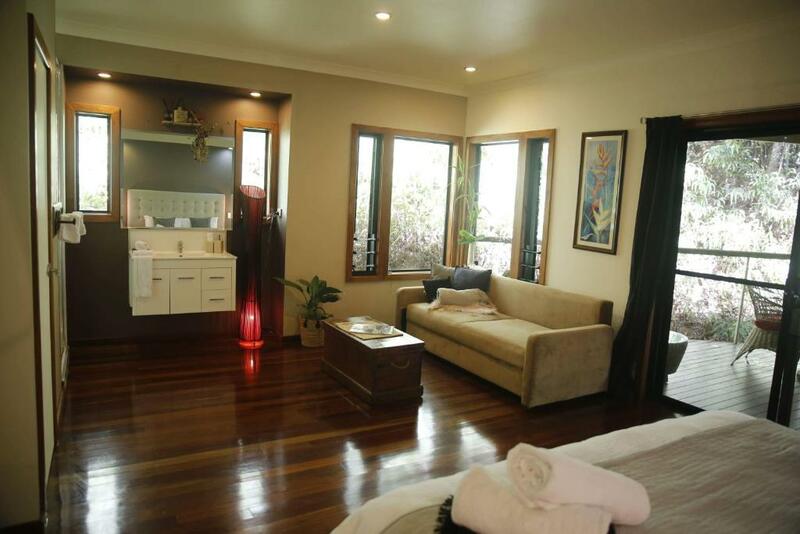 Treetops Retreat Cairns accepts these cards and reserves the right to temporarily hold an amount prior to arrival. Guests should note a surcharge of 2% on all credit card payments. 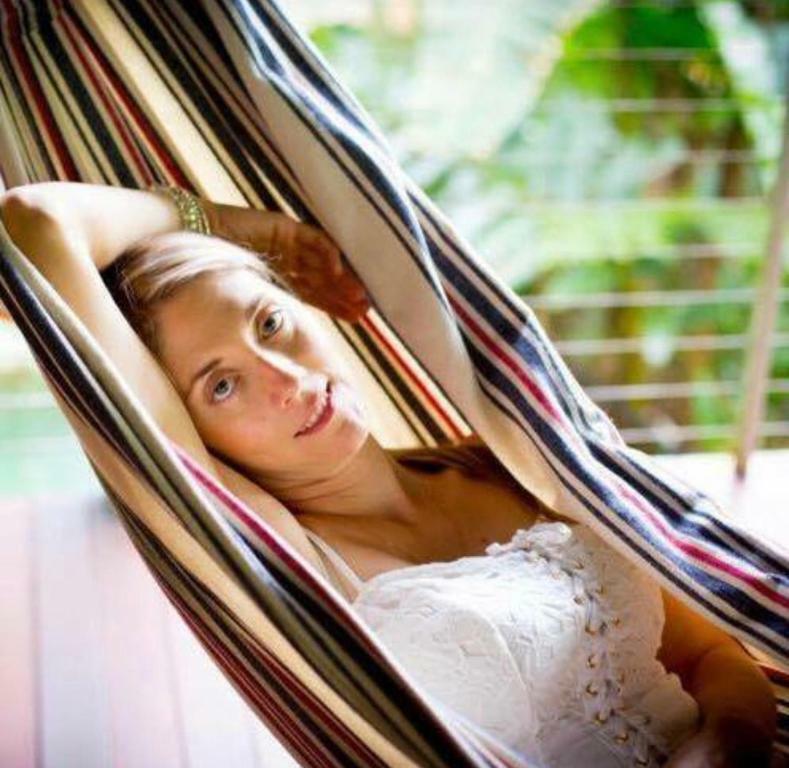 Please inform Treetops Retreat Cairns in advance of your expected arrival time. You can use the Special Requests box when booking, or contact the property directly with the contact details provided in your confirmation. Everything! It’s a truly amazing place. We only stayed the 2 nights but couldn't find anything to fault in this time. Large Balcony facing to rainforest with BBQ facility, Sofas. Kids really enjoyed the entire property. We all loved the spa!